Recorded by Wolf Younin and Barbara Kirshenblatt-Gimblett, Bronx 1975. In addition to knowing many old folksongs, Frahdl Post was an active performer who sang popular novelty and Yiddish theater songs. You can hear how much she enjoys singing one of those parodic, comic songs in this week’s blogpost. At one point in the recording, when she sings “mosquito” you can hear the interviewer Wolf Younin get very embarrassed by the cheeky words. 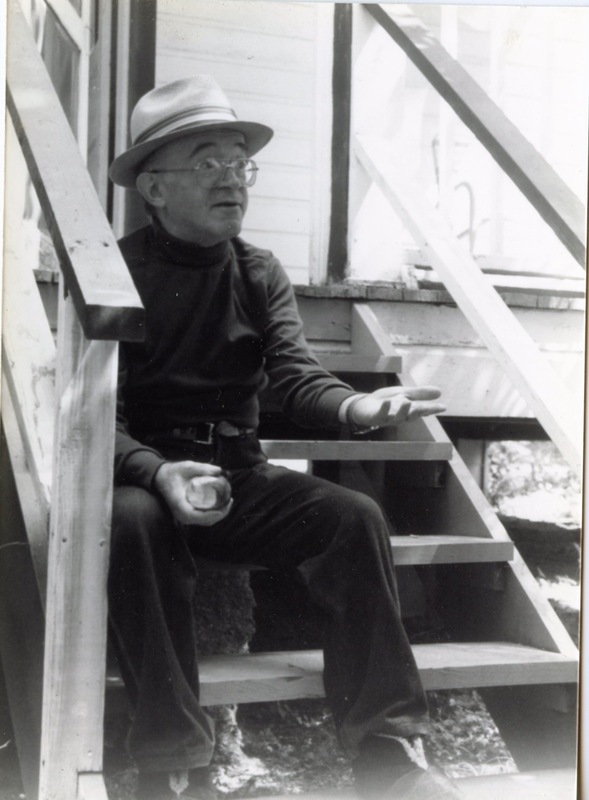 The Yiddish lyricist is Louis Markowitz who often wrote lyrics for Burstein and is also often credited as composer. Other Yiddish “Spanish” parodies by Markowitz for the Bursteins include Yiddish versions of “Quanta Lo Gusta” and “Mama Yo Quiero”. 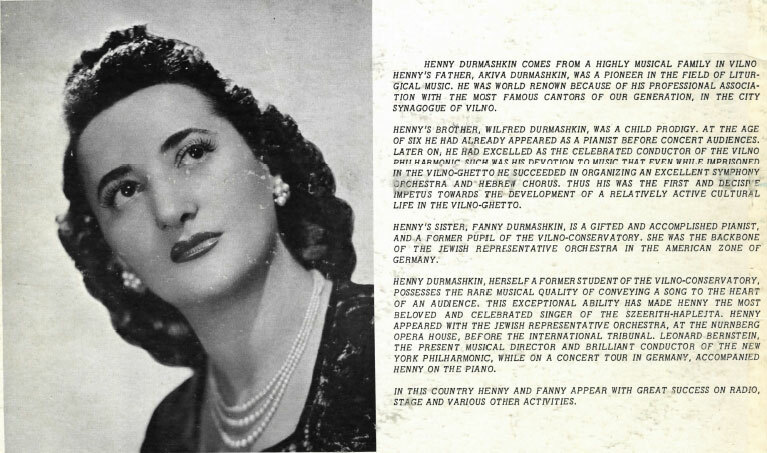 He also composed many Yiddish parodies for Banner records and Miriam Kressyn and Seymour Rechzeit and is certainly worthy of a more in-depth study as the king of Yiddish parody songs. According to a1951 Billboard article Der Galitsianer caballero was his first Yiddish parody. 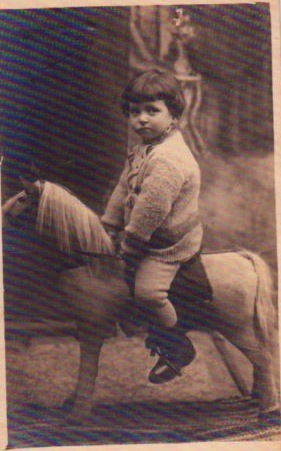 Henry Carrey who submitted the Frahdl Post recordings and is her grandson, transcribed the original Pesach Burstein version of 1929. We are attaching that transcription which should be consulted when listening to the field recording since Post sings some lines differently and some words are difficult to understand. 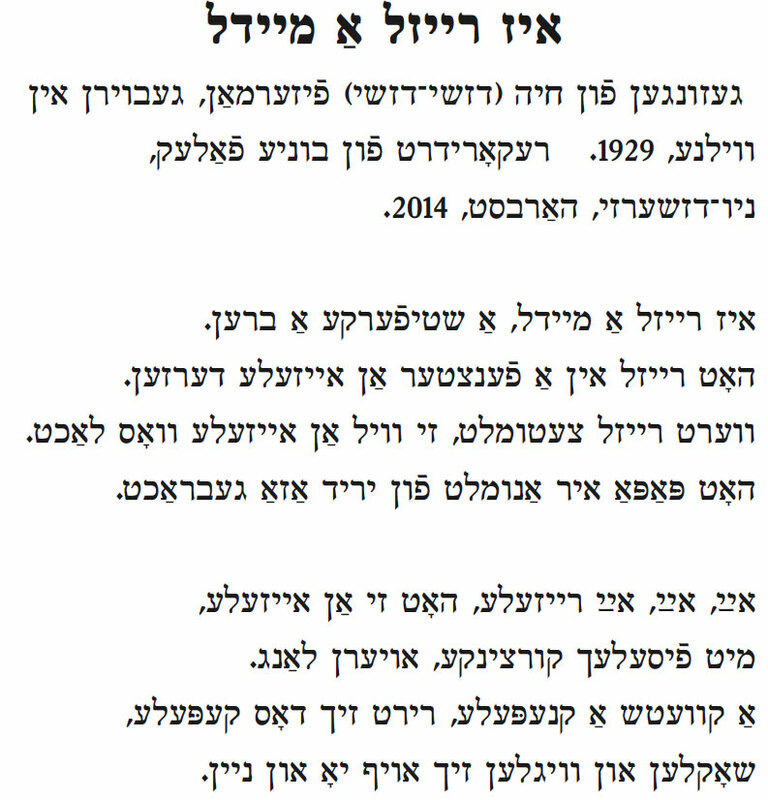 We have transcribed Post’s version and translated it and written it out in Yiddish as we always do. There is humorous wordplay in the Yiddish which we did not seriously attempt to duplicate in the translation. Note: “Slek” is American/British Yiddish for the time when there is no work; from the English word “slack”. Thanks this week to Lorin Sklamberg and the YIVO Sound Archives for the 78 recording and image, and to Henry Carrey. Nor, vi dortn iz “slek” – nokh Meksik avek. in yetzt bin ikh a Meksikaner. wanted to be an American. and now I am an Mexican. 2) In Meksike iz git-o, yes-sir. Me git dort a trink un a fres-sir. Mit gur vaynik gelt, ken men brenen dort a velt. Leybn vi Got in Odes-o. In Mexico it’s good – Oh yes-sir. One drinks and eats well. and live like God in Odessa. A royt zaydn hemd un di hor sheyn farkemt. and bought a hat, a sombrero. A red silk shirt and nicely combed hair. 4) Ikh hob shoyn getun dortn ales. kh’ob oysgezikht far mir a sheyne kale. Di pekh shvartse hur, di shlanke figur. Z’hot gebrent vi a heyse “tamale”. I have already done everything there. I have sought out for me a pretty bride. She burned like a hot tamale. 5) Zi hot getantst mit ire fis un ire hento. un geshoklt mit ir Sacrament-o. Nokh a por glezlekh vayn, gefilt hot zi fayn. After a few glasses of wine, she felt fine. and showed her best talent-o. Z’hot geshvorn on a shir, tray blayt zi mir. She bit me like a mosquito. She swore with no end, that she would stay faithful to me. 7) Ir libe is gevorn beshayter. Geholdzt un gekisht un azoy vayter. Nokh a kish gibn ir, zugt zi glakh tsu mir. az zi hot du a man a “bullfighter”. Her love became more wanton. We necked and we kissed and so forth. that she has a husband, a bullfighter. Ayn mol erklert zikh in libe. Halt shoyn nuvnt mit ir, plitzling efnt zikh di tir. Listen to how this incident played out. Was getting closer to her, when suddenly the door opens. And her husband enters the room. 9) Ir man iz a rizת an “atlet-o”. In hant halt er gor a “stilleto”. Er hot mir ongekhapt, mayne beyner tseklapt. Kh’bin geylgn tsvey vokhn in bet-o. In his hand he holds a stillet-o. He caught me and beat my bones. I lay in bed for two weeks-o. Ikh fil ven eykh shtay, ven ikh zits-e.
Tsu vern Mexikaner oder Amerikaner? Fur ikh krik nokh Galitsye. I swear that I am not joking. I can feel it when I stand, when I sit. Should I become a Mexican or American? I am going back to Galicia. 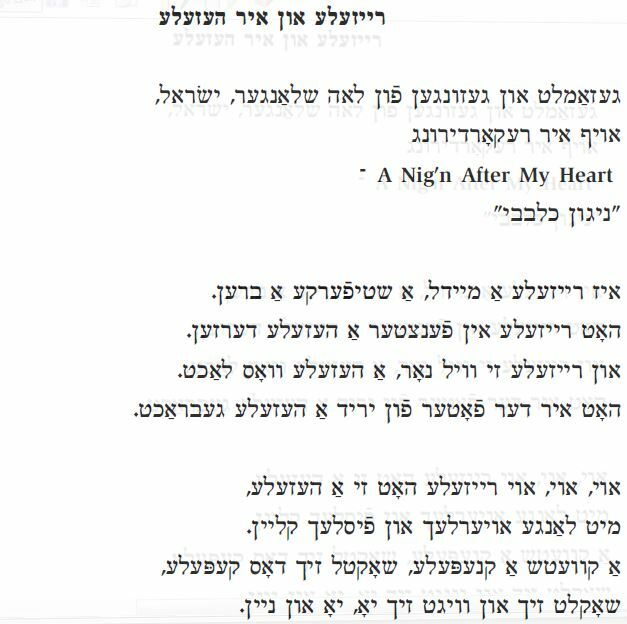 In connection with my uncle Mordkhe Schaechter‘s (MS, 1927 – 2007) yortsayt a couple of weeks ago, I am featuring a short children‘s song, “Oy, kh‘bin gegangen eyns‟ (“Oy, I Went One”) that he sang for the collector Leybl Kahn in 1954. (see the earlier post of another song performed by him). Mordkhe Schaechter at Yiddish Vokh, Circle Lodge, NY 1985. A longer version of this cumulative song involving animals “Tsimba-rimba‟ was recorded on the CD Di grine katshke (Living Traditions 1801) in 1997 produced by Living Traditions. Lorin Sklamberg is the lead singer and according to the notes, he learned this song from “Inna Slavskaya, a Soviet immigrant singer now living in Berlin, Germany. Inna learned the song from her mother‟. Unfortunately, MS only sings three verses because, as he says later in the recording for Kahn, he only wanted to make sure he got the melodies down before he forgot them, and wasn‘t concerned with the words. 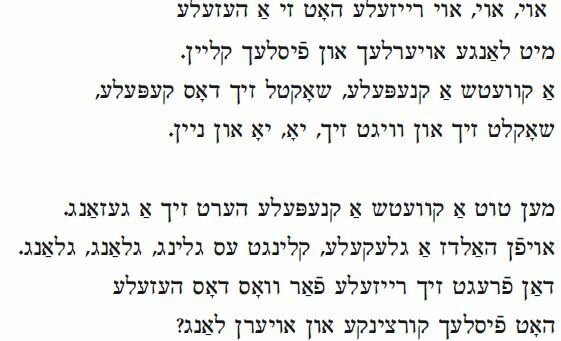 It is possible that in a 1953-54 issue of Der seminarist, a journal of the Yidisher lerer-seminar in NYC, he printed all the words. I hope to find the issue and if the words are found, we will add them to the blog. S’iz a kinderlidl vos ikh hob fartseykhnt fin a froy fin zlotshev, mizrekh-galitsye. It’s a children’s song that I recorded from a woman from Zlotshev, Eastern Galicia (Today, in Ukraine – Zolochiv). Oy, ikh bin gegangen ayns, far vuz zhe nisht keyn tsvay? ikh hob gezeyn a hin. Vi azoy zhe makht di hin? dun de de dundun makht di hin. Oy, I went one, so why not two? I saw a chicken. What sound does a chicken make? Oy ikh bin gegangen tsvay, far vuz zhe nisht keyn dray? Ikh hob gezeyn a hun, vi azoy zhe makht der hun? dun de de dundun makhe di hin. Oy, I went two; so why not three? I saw a rooster; What sound does a rooster make? ikh hob gezen a ganz, vi azoy zhe makht di ganz? SPOKEN un azoy vayter, un azoy vayter. Oy, I went three, so what not two? I saw a goose. What sound does the goose make?